Kiwanis Club of Skidaway raises awareness about at-risk children’s needs, and working to meet them is an integral part of all of our activities. We provide financial and service resources through our community events, our corporate sponsor program, and our members’ commitment of time, talent and treasure. Since Kiwanis Club of Skidaway was established (in 1988, initially as Golden K of Skidaway), we have supported more than 40 area organizations in Chatham County and donated countless thousands of volunteer hours; and we have provided more than $1,500,000 of grants. The primary focus of our fundraising is to support local agencies that serve at-risk children and their families. During our fiscal year ended September 30, 2018, our club mobilized $85,000 to support projects and programs that serve children. 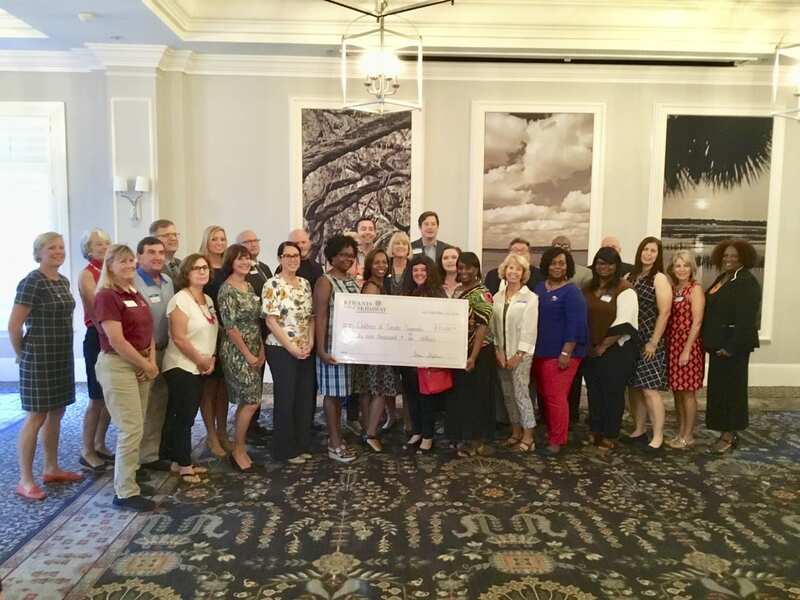 This amount includes $11,000 raised in a dedicated fundraiser for Savannah Early Childhood Foundation, hosted in partnership with Rotary Club of Skidaway Island, that attracted a 100% matching grant from [name]. $71,000 of grants were awarded on September 27, 2018 to the agencies listed below; and $900 in Dollars for Doers awards were made earlier in the year. In addition during the year, the club provided $2,100 of grants to Kiwanis International, Kiwanis Georgia District, Richmond Hill Key Club, and the new Kiwanis Club of Pooler. We recognize and thank our Corporate Sponsors for their generous support of our fundraising efforts. Our Service Leadership Projects include: Junior Achievement, Special Olympics Bowling and Track & Field, L.O.V.E. Mentoring, and Backpack Buddies; and our members are involved in many other hands-on service projects. These agencies received Kiwanis grants. Scroll down to learn more about these agencies and how they plan to use our grant. Dollars for Doers provides $300 awards to support specific programs or events. Through the Kids Cafe program, America’s Second Harvest of Coastal Georgia provides direct intervention feeding, after-school programs, and mentoring for at-risk youth at 49 locations to more than 2,800 children each day. The program ensures that children have a safe, nurturing place to go during the critical hours after school when parents are often working. Our grant will be used to purchase food and to ensure children have proper nutrition. Another program of America’s Second Harvest, Backpack Buddies of Skidaway Island provides food to 70 Butler School children. Food is packed up each week by a team of volunteers and then delivered by other volunteers (currently Kiwanis members) for the teachers to distribute to the eligible children for the weekend. Our grant will be used to purchase milk, juice, fruit, cereal, vegetables and protein. Coastal Children’s Advocacy Center provides a confidential, child-friendly site for video-recording forensic interviews with child abuse victims and witnesses to violence. In addition, it offers counseling, play therapy, crisis intervention, referrals to other community agencies, court testimony and follow-up services. Our grant will be used to purchase informational materials for families and supplies for play therapy. Faith Equestrian Training Center- Faith Equestrian Therapeutic Center (FETC) provides a therapeutic riding program for children with disabilities who live in Chatham, Effingham, Screven, Bulloch, and Bryan counties. The children are taught grooming, horse leading, and riding skills. The benefits of their therapeutic horseback riding experiences include improved fine and gross motor skills, improved motor coordination and balance, and improved core strength. Horseback riding also provides the children with positive sensory stimulation and the opportunity to develop improved social skills and self-confidence. Family Promise of Coastal Georgia, through a network of host congregations, provides shelter, a day center, meals and individualized supportive services that ended homelessness for 93% of the families served in 2014. Our grant will be used to purchase curriculum materials, online security for academic literacy programs and field trips for the children and youth. The Fresh Air Home is located at Tybee Island and serves at risk children, ages 4-11. Each summer, the camp is open for four 10-day overnight sessions. The children are exposed to the natural beauty of the ocean and the beach daily and enjoy music, arts and crafts, talent shows and multiple field trips. So many Savannahians speak of attending the camp with such extraordinary memories. The daily program at the Home consists of play on the beach, supervised games on campus, crafts, music, Bible stories, and field trips. Campers visit Ft. Pulaski, Skidaway Marine Center, Juliette Gordon Low House, and enjoy dolphin tours. Girls on the Run provides after school programs for girls in 3rd– 8th grade and is a new grant recipient for Kiwanis Club of Skidaway this year. The lessons for elementary school girls encourage positive emotional, social, mental and physical development while weaving running into the program. We encourage girls to examine and better understand who they are and what is important to them. Heart & Sole, for Middle School girls, addresses the challenges facing girls in this age group. The program helps them sift through conflicting messages about their worth, their abilities and their value. Both programs address bullying, social media issues, body-image and negative media stereotypes. GOTR also runs Summer Camps. In all cases, GOTR helps girls manage their emotions, resolve conflict, help other people, and make intentional decisions. Greenbriar Children’s Center’s mission is dedicated to the healthy development of children and to the strengthening of families. Through several interventional and emergency shelters and programs, they serve children and families at risk in the Greater Savannah area. In 2018, they served 315 clients and provided the only independent living program for at-risk teens in Southeast Georgia. Horizons Savannah, an affiliate of Horizons National, provides an academic, cultural, and recreational program to 180 students from low-income families, helping to close the achievement gap by preventing summer learning loss and encouraging academic growth. Students attending Horizons reverse the accumulating summer learning loss on average 2-3 months’ worth of skills each summer. Through the time, talent and resources of corporate, education and community partners, Junior Achievement of Georgia inspires and prepares young people in K-12th grade, to succeed in a global economy. All programs align with Georgia’s Common Core Performance Standards, to teach students about financial literacy, entrepreneurship and workforce readiness. Another new grant recipient is Loop It Up Savannah a community art non-profit which began as a children’s knitting and crochet class and in 2015 incorporated as a non-profit. They currently bring art workshops and enrichment programs to over 5000 children each year. They bring afterschool programs, school residency programs and summer camp experiences to children of Savannah who are living in low-wealth communities and would not otherwise have opportunities to participate in extra – curricular and enrichment programs. Programs include visual arts of all kinds as well as performing arts, culinary arts, yoga and music. All programs have a strong focus on developing the student’s literacy, math and social skills, and give them many opportunities to apply those skills giving them opportunities to develop a strong sense of themselves as well as a sense of responsibility for our community. L.O.V.E. Summer Camp provides 60 to 70 children who are mentored during the school year with an opportunity to enjoy the days of summer and build on the reading, math, and life skills they developed during the school year. In addition, some of the camps teach children to swim or work on drawing and pottery-making skills, learning how to interact with other children along the way. The Mediation Center of the Coastal Empire is a not-for-profit organization serving individuals, children and families at risk and in need of assistance. The center engages the power of volunteers and education to transform conflict into opportunity and increase access t justice. Kiwanis’ grant helps to fund the growth of youth programs, specifically Peer Mediation and COPE. The National Museum of The Mighty Eighth Airforce engages and educates visitors through the use of exhibits, artifacts, archival material and stories toward achieving an understanding of the history and evolution of the Eighth Airforce and American Air Power. Over 37,000 students participate in “Character Counts”, exhibits that support education programs. Park Place Outreach is an emergency shelter for neglected, abandoned, abused, homeless and runaway youth ages 11 through 17. They also run a street outreach program to assist young people up to the age of 21 with information and assistance regarding homeless issues and support services available in our area. In 2014 the program served 89 clients and disseminated 9,600 informational handouts. Performance Initiatives provides a safe and thriving after school environment for inner city youth. Coaches, tutors, and volunteers offer a variety of programs including athletic training, academic support, counseling, emotional wellness, fitness classes, summer camps and nutritional snacks. Clients learn how to defuse situations without violence while learning self-defense. They build confidence, organizational and leadership skills. Social Apostolate provides services to the homeless or “at risk” by providing hot meals, showers and hygiene; thrift store with highly discounted clothes and necessities; and services such as obtaining birth certificates, back-to-school needs, emergency medicine prescription assistance, clothing for job interviews, work shoes, special tools and transportation, eye exams and glasses, grocery assistance and emergency baby needs. Special Olympics Area 17serves about 1,000 athletes aged 2 to 21 and their families providing year-round sports training and athletic competition in a variety of Olympic-type sports for all children and adults with intellectual disabilities, giving them continuing opportunities to develop physical fitness, demonstrate courage, experience joy, and participate in the sharing of gifts, skills, and friendship with their families, other Special Olympics athletes and the community. Union Mission exists to prevent and end homelessness in the greater Savannah area. Our grant to them supports ones of its programs- Magdalene House which, In 2017 served 121 homeless women and children. These 41 families were not only removed from the dangers of living on the streets and given safe shelter, but they were also provided meals, access to intensive case management, mental health services, plus employment and training opportunities. Magdalene House is a place of safety and support, dedicated solely to women and their children, offering not just shelter, but a helping hand in a time of crisis. For more than 66 years, Wesley Community Centers of Savannah has provided critical services to women, children, and families who are homeless and/or low income. Numerous programs work together to provide wrap-around services that create both short-term and long-term solutions to help people out of poverty. These services include Wesley’s Early Childhood Education Center, the Lady Bamford Early Childhood Education Center, the Multi-Cultural Youth Arts Camp, and the Women Center. Through its “Y Readers” program,YMCA of Coastal Georgia offers an extended school day for students who are falling behind their grade level in reading or are at risk of falling behind (high rate of school absence, tardiness, behavior referrals, non-proficient score on state test for reading) to raise or maintain their academic standing, increase their reading scores, feel more confident in their classrooms, make gains in academic success and improve school conduct and self-efficacy. Youth Challenge Academy is a military-structured residential program providing GED and high school diploma programs, physical fitness, and discipline to 16 to 18 year-old high school dropouts. Our grant will be used to hire three part-time tutors for each of the two classes for the year.